This is a tale of love and marriage. Of star crossed love. My mother has a vegetable patch. It is only a small one – which she has tended for years. Up until this year, it was about 3 metres long by 1 metre deep and into it she has planted small numbers of a variety of leafy vegetables. She also plants Cherry Tomatos. These she plants in pots to avoid the cursed Nematodes. These tomatoes grow at the rate of knots. They grow up the wall, hit the eaves at the roofline and start growing back down again. They bear masses of trusses of fruit and have been delicious. This year, having read about the ‘no dig’ method of gardening, she decided to expand the size to be 2 metres deep. 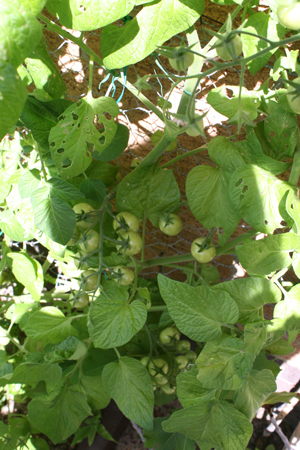 Filled with compost and manure, it was no surprise when a large number of ‘Cherry’ tomato plants suddenly appeared. A couple of years ago I was motivated to emulate her. Filled with visions of lush plantings and fresh vegetables to hand, I decided that I would favour the heritage varieties and purchased a number of different seeds. Dreams of monster tomatoes and muticoloured radishes prevailed. It was not a success. It is a sad tale of failed plantings, pestilence and apathy. Of shrivelled vines and infested fruit. Sufficed to say, my enthusiasm was somewhat shortlived – with the result that I had a surplus of seeds going to waste. Generously, I handed them to my mother – with no thought of benefitting from her labours. One of the packets of seed was for a ‘bush bean’. My mother planted 3 of the seeds. She is not sure why she only planted 3. The obvious approach is to plant many in the hope that some would survive – and if there are too many, thin out the surplus. In any event, 3 plants appeared – but 2 failed to take. The one remaining plant – lets us call it Harry – grew as it should. Alongside Harry, appeared a cherry tomato plant. Side by side they grew, flourishing in the rich soil.